Earlier Houseboats of Kerala are known as "Kettuvallam", these huge, ling and tapering barges were traditionally used to cargo tonnes of goods across kingdoms, with portion covered with bamboo and coir serving as a rest room and kitchen for the crew. A familiar sight on the Backwaters, these vessels are built entirely with out nails. Plants of jackwood are joined together and coir rope and coated with caustic black resin made from boiled cashew kenels. With careful maintenance they last for generations. Today widely and appropriately called Luxury Houseboats, they carry furnished bedrooms, modern toilets, cozy living rooms, a kitchen and even a balcony for angling. As you cruise down the canal you can see morning newspaper and mail delivery by boat, vendors in boat paddle from house to house selling everyday provisions like rice, vegetables, oil, kerosene etc. with hundreds of quacking ducks around. Also you can see village activities, fisherman's activities and see old beautiful temples, churches and old fashioned Kerala. Arrive Kochi : Arrival at Kochi (Cochin) meet and assistance at the railway station by our representative and transfer to your hotel. Half day sight seeing of Cochin by boat. A few interesting sites included in the tour are the Chinese fishing nets along the Vasco Da Gama Square, Santa Cruz Basilica, St. Francis Church, VOC Gate, Bastion Bungalow etc. Apart from these architectural splendors, an array of restaurants serving fresh seafood is also popular among tourists. Over night stay at hotel. Kochi to Munnar ( By Road 130 km in 4 hr ): Proceed to Munnar enjoying the scenic beauty & the marvelous waterfalls, high mountains with the low flying clouds passing by. Enjoy boating in the afternoon. Overnight stay at hotel. In the morning depart for Munnar (approx.4 hours journey), enjoying the scenic beauty & the marvelous waterfalls, high mountains with the low flying clouds passing by. Arrive Munnar and check in at hotel. Overnight at Munnar. Munnar - Anamudi - Munnar : Morning, after breakfast, visiting tea plantations, Anamudi, Eravikulam National Park, Devikulam, Mattupetty, Pallivasal, Pothamedu, Attukal etc. Rest of the day at leisure. Overnight at Munnar. Munnar - Periyar ( By Road 110 km in 3 hr. ): Morning, proceed to Periyar on the way visiting Idukki dam. On arrival check in at hotel. Periyar wildlife sanctuary is home to nomadic tribes of wild elephant, boar, deer, the great Indian tiger and more. Evening go for boat cruise in the lake to watch wild animals. Overnight stay at Periyar. Periyar:Morning, after breakfast boating through Periyar lake - Wildlife sanctuary. You can visit the rare species of plants and animals. Afternoon visit spice plantations like cardamom, cinnamon, pepper, coffee, tea estates etc. on your way back to the hotel, you could stop at the local market and pick up some fragrant spices.Overnight stay at Periyar. Periyar - Kumarakom ( By Road 130 km in 4 hr. ):Early morning proceed to Kumarakom. Reach and visit the Bird Sanctuary. Proceed to the Vembanand Lake. The backwaters of Kerala are a unique product of Kerala and are found nowhere else in the world. 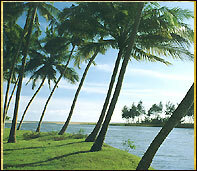 Backwaters are a network of lakes, canals and estuaries and deltas of forty-four rivers that drain into the Arabian Sea. The backwaters of Kerala are a self supporting Eco-system teeming with aquatic life. The canals connect the villages together and are still used for local transport. Over 900 km of this labyrinthine water world is navigable. Check into a traditional houseboat of Kerala Style and go on a leisurely backwater cruise along the lake on a thatched houseboat. The houseboat with all modern comforts lets you discover the countryside at your own pace. You will have lunch, dinner and breakfast in the Houseboat. A ride on the houseboat is a fabulous way to explore the fascinating beauty of the backwaters. Cruise through the backwaters to Alleppy. Overnight at Houseboat. 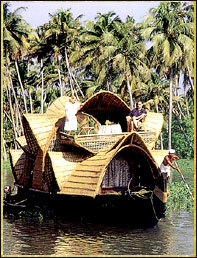 House Boat Cruise:Today also you will be cruising through the backwaters of Kerala and stay overnight in the Houseboat. Alleppey : Disembark the boat at the reception of the backwater resort at Alleppey. Check in at the resort. This resort is one of the finest one in Alleppey Here you can enjoy the lively villages and backwaters. Overnight at Alleppy. Kochi:After breakfast proceed to Kochi. Reach and spend the day shopping. In the evening proceed for KATHAKALI DANCE PRESENTATION. Overnight at Kochi. Departure :Breakfast at hotel. Visit Shiva Temple and transfer to airport/railway station according to the timings of flight/train.